3-D Tic-Tac-Toe is a puzzle game released by Atari for the Atari 2600 console and Atari 8-bit family in 1980. In the late 2000s it was released with the Atari Flashback 2. The game is similar to the traditional game of tic-tac-toe, but is played on four 4x4 grids stacked vertically on top of each other; it is basically a computerized version of the board game Qubic (by Parker Brothers) using traditional tic-tac-toe notation and layout. To win, a player must place four of their symbols on four squares that line up vertically, horizontally, or diagonally, on a single grid, or spaced evenly over all four grids. This creates a total of 76 possible ways to win, in comparison to eight possible ways to win on a standard 3 × 3 board. 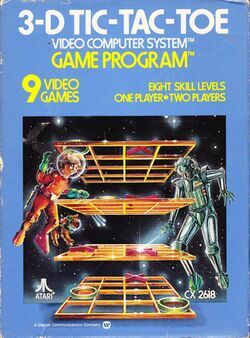 The game has nine variations, it can be played by two players against each other, or one player can play against a built-in AI on one of eight different difficulty settings. The game uses the standard joystick controller. This page was last edited on 6 January 2015, at 18:34.